Trinity Designs: Yet Another Reason to LOVE Stampin' Up! I know I've said it before, but it bears repeating - Stampin' Up! is a Class Act! Most of you know that I spent 13 years with another sales company (which has now closed their doors) and as much as I enjoyed some aspects of what I did, I can honestly say that I was never made to feel as special as Stampin' Up! has made me feel. Every time we turned around - or went back to our rooms it seemed - we were receiving gifts while at Founder's Circle. The first night we all returned to our rooms after a fabulous meal; served most elegantly on gorgeous Black and White damask table linens; to find this adorable Toiletry Bag hanging from our showers! 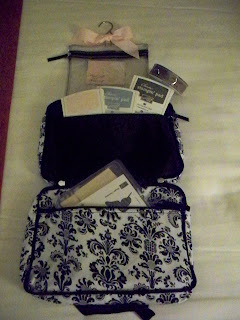 As you can see, it was filled up with some of our favorite things - stamps, ink and RIBBON! The next day was our Business Share Pajama Party and we all received this beautiful matching journal and pen set. And look how elegant everything looks! That pink ribbon is the new Pink Pirouette Wide Grosgrain! When we returned back to our rooms, we found a pink leather wallet that matches the beautiful pink bags we all received at convention! I love how everything had a little note attached to it. Shelli even had a little pink note at each of our placesettings at the first night dinner. 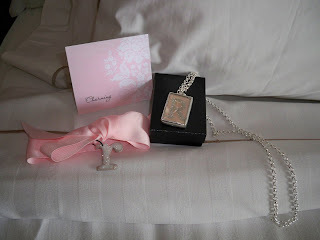 The next day, we returned to our rooms only to find these fabulous necklaces on our beds! Shelli had been wearing one the previous day and we were all commenting on how cool it was! I bet she was having a hard time keeping the secret! Each necklace was hand made for us in Utah and has our initial in glitter under a big jewel on one side and the other side has animal print. Look at the initial on the ribbon! It is a piece of On Board chipboard, painted in White Craft Ink and coated with glitter too! Love it! 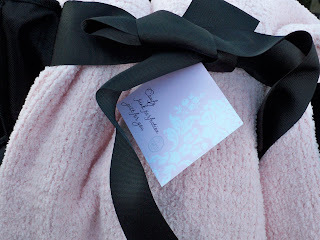 And last, but truly not least, was this comfy, fluffy, cozy pink blanket that was waiting on our chairs at the outdoor dinner and movie night for our final night celebration! SU! drove us out to a private golf club near St. George, Utah and guess what? It's where High School Musical 2 was filmed! How cool is that? Of course, I had to call home to tell Emma and she thought I was the coolest Mom in the world - well she already does, but now it's better! I'll post some pictures of the scenery tomorrow, but if you just can't wait, go to my friend Tiffany's blog on my sidebar - My Crafty World. She has some very funny pictures of me doing Zac Efron dance moves on the golf course and enjoying all the free movie candy and popcorn! Robin, these gifts are so beautiful. Stampin' Up! is a wonderful company and you deserve to be pampered! Go get em girlfriend!